Science Project Kit - a comprehensive test kit for comparing the water quality of up to 4 different water samples. Results on the spot. Great tool for science projects that check quality of drinking water. Water Quality Science Fair Kit tests for the following water contaminants: Lead, Bacteria, Pesticides, Nitrates, Nitrites, Chlorine, Hardness and pH. 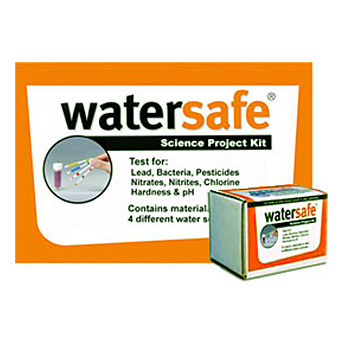 WaterSafe Science Fair Testing Kit WS-425SP contains material to test 4 different water sources, project outline and data sheet. Set of 4 water test kits for 8 different contaminants, total of 4x8 = 32 various tests. Kit also contains an interactive CD that displays and compares your findings, simply enter your data and print results. 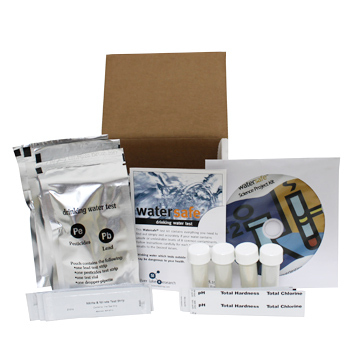 Watch this video to see how easy it is to use WS425SP WaterSafe Science Fair Water Project Kit to test multiple water sources for school science projects. 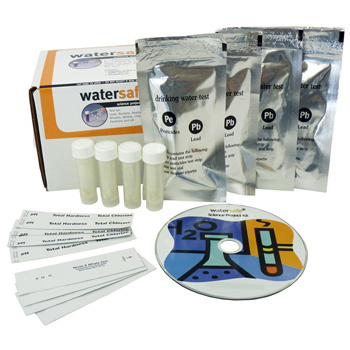 Science Project kits use industry standard water testing technology (test strips, etc.) and provide color coded results. They are equally suited to be used for children on school projects, or to check if your water filter is working as intended. Recently my daughter Lizzy needed help finding a topic for her science project. I did some research on line to see what we could do when I found this kit. After speaking with a sales professional who explained the whole kit we thought this would be unique. A few days later the kit arrived and my daughter was very excited with the outcome of her project. It was a great bonding experience. I highly recommend this kit to all parents in a situation like I found myself in. My daughter won first prize in her school science fair thanks to this science kit. What a great product! It’s very easy to do, and understand. Good drinking water is important to everyone. People found it fascinating what this kit shows, and teaches or children. This is a great, affordable activity to do with your kids either for a school project, or for some at home fun. My daughter and I are more than pleased with our decision to perches this kit.